The Series III 700 Twin is BY FAR the most impressive 700 twin on the market!! However;as you read above (hopefully), it is plagued by poor heat conduction from the piston to the cylinder wall via the ring. RK Tek tried various combinations, including cryo-genics and other treatments.. but was unsuccessful in solving the problems associated with the OEM pistons and rings. This forced us to come up with another solution to the problem and the solution is the 734cc Big Bore kit. This kit is nothing short of OUTSTANDING!! Throughout the 2003 season.. we logged over 4000 TROUBLE-FREE miles on this kit!! This set-up is absolutely bullet-proof!! Besides being bullet-proof.. this kit produces some serious POWER! It is no contest against another 700 or even an 800 twin!! GONE!! are those inconsistent running DOO 700's!! This kit is nothing but SOLID!! The 734 is rated at 150HP (with full porting) on pump gas and has an EXTREMELY wide power-band. This engine's torque curve is so broad it is truly amazing!! NOTE: The 600 HO cylinders can also be made into the 734cc KILLER!! This kit uses your stock cylinders! It is a total SLEEPER!! We strip and bore your stock cylinders to an 80.00mm bore. Your cylinders are then fitted with our custom sleeve. The 600HO to 734cc is a Custom Sleeve vs a Re-Plate. The 600HO can be made into a 766cc engine because of this sleeve. Here is the breakdown for this awesome kit! Porting Option.. Great performance addition but not required. The engine's port timing is drastically altered due to the piston's unique geometry. So, even is you choose the non-ported 700-734 kit, the porting is drastically altered. 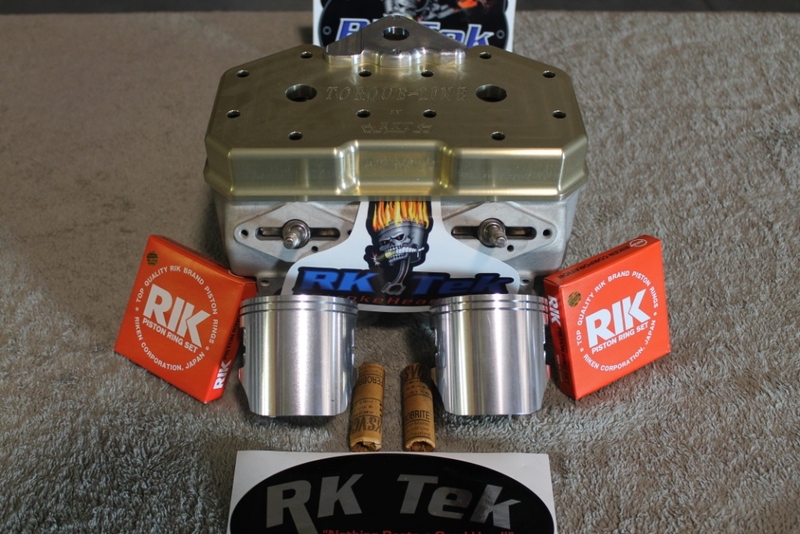 RK Tek has developed an Over-Bore kit for the TNT/500SS/600 Series III Engine. This over-bore turns your 600cc engine into a 662cc engine. We use the same piston in this kit that is used in out 734cc over-bore (600HO and 700 Series III Engine). Besides the awesome power increase, the benefit of not having the power-fade associated with the single ring piston (OEM) is what you will really notice when running this kit. RK Tek spent a better part of the 2007 Season developing a performance package for the new Rotax 800R Engine. Since RK Tek is known for their unique and effective methods for “fixing” Rotax engine issues, this new engine was surely going to get the “full treatment” and get a “makeover”. This “makeover” came in the form of a new dual ring, piston and a new billet head with a very efficient combustion chamber. The new 860R from RK Tek is rated at 180HP on 91 octane fuel with the stock exhaust system. Peak power is accomplished at 8200 rpm vs. 8500 (stock 800R). The torque curve is extremely broad and linear which allows for VERY easy clutch tuning. Fuel economy is INCREASED over the stock 800R due to the more efficient engine.